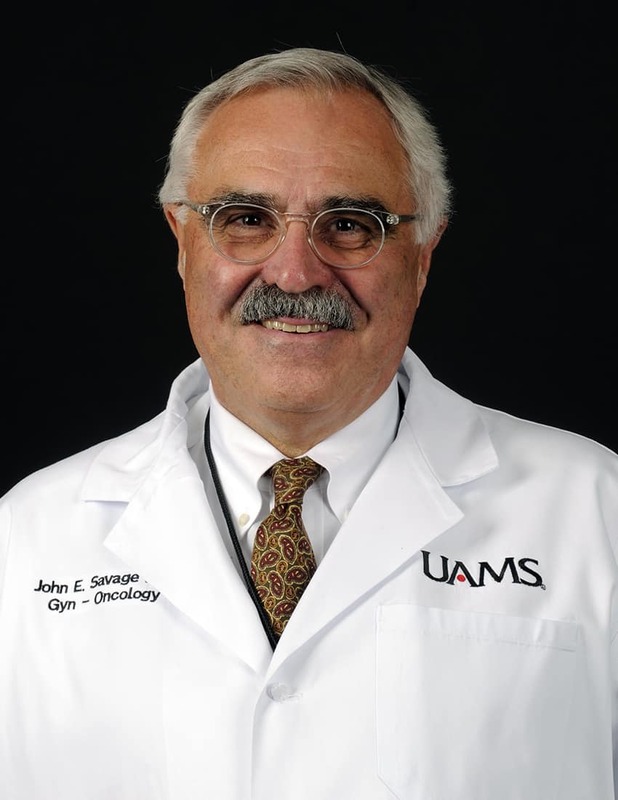 Dec. 6, 2016 | LITTLE ROCK — Fellowship-trained gynecologic oncologist John E. Savage, M.D., has joined the University of Arkansas for Medical Sciences (UAMS). He sees patients in the second floor clinics at the UAMS Winthrop P. Rockefeller Cancer Institute. Savage earned his medical degree at the University of Iowa. After completing his internship at Los Angeles County University of Southern California Medical Center, Savage returned to the University of Iowa for his residency and fellowship training. Savage previously served on the faculty of the University of Iowa and the University of Minnesota Medical School, as well as holding the position of director of gynecologic oncology at both St. Paul Ramsey Medical Center in St. Paul, Minnesota, and Hennepin County Medical Center in Minneapolis. He worked in private practice for more than 20 years. Savage is certified by the American Board of Obstetrics and Gynecology (ABOG) and the ABOG Division of Gynecologic Oncology. He is a charter member of the International Gynecologic Cancer Society; a fellow in the American College of Obstetrics and Gynecology and American College of Surgeons; and a member of the Society of Gynecologic Oncologists, Central Association of Obstetricians and Gynecologists, and Gynecologic Oncology Group.